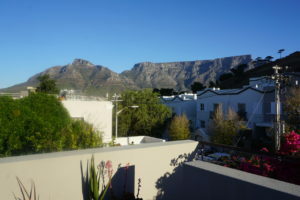 The day plus of travel to Cape Town was remarkably unremarkable. By my calculations, the 26 hour trip door-to-door was 14 hours longer than Avital and Eliav’s previous record. Yet, they were amazingly good – no meltdowns, no notable misbehavior or fighting, no tormenting other passengers. Essentially, my biggest worry of the trip is behind us. The only notable moment on the plane was when another passenger collapsed next to me short of breath calling out for help shortly before our stop in Dakar – but a call to the stewardess (and me standing up to waving to them that it was actually an emergency) brought her oxygen, me wine and all without waking the kids or Karen. So (eventually) we all woke up this morning finding ourselves in Cape Town. 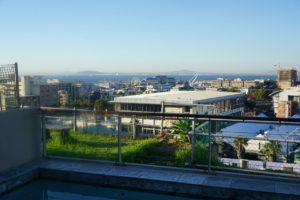 Our flat in De Waterkant has a great view of Table Bay from the splash pool and one of Table Mountain from the hot tub. After a lazy morning and a few errands, we were inspired to take the cable car up to Table Mountain and walk around the plateau for a couple of hours making our way to the highest point. Along the way, Avital spotted Rock Hyrax – allowing her to check her first mammal off her wildlife checklist. That left us with time in the evening to check out the Waterfront and watch our first South African sunset over the Atlantic from the top of the Ferris wheel. 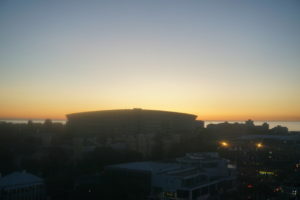 All in all, not a bad way to start our adventure. So excited to follow your journey!!! !